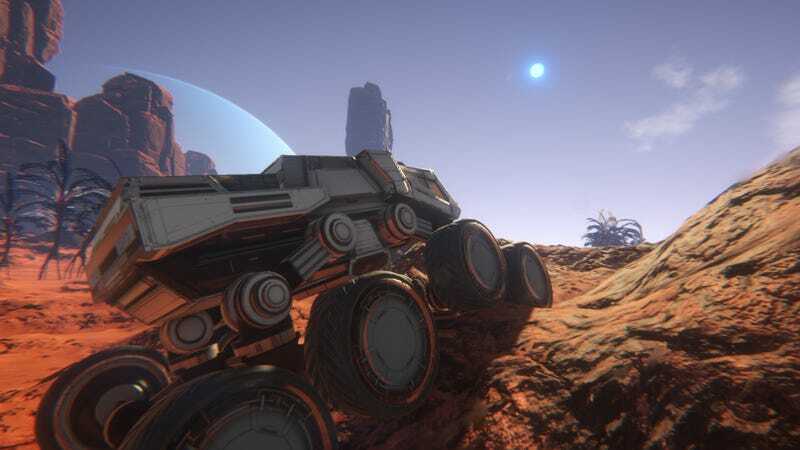 Osiris: New Dawn is a space exploration game out in Early Access on Steam. It’s a vast but unfortunately tedious take on the survival genre. There’s a lot of potential but a long way to go if the game wants to dominate the field. With the mixed response to No Man’s Sky, the space exploration genre seems well primed for another title to swoop in and give people what they want. Osiris seems ready to do just that, offering a similar array of core features while also expanding on them for a more comprehensive experience. With base building, a leveling and skill system, and a furious attitude to combat Osiris is sure to entice players who wanted a bit more out of their experience traveling the galaxy. Still, I’m unconvinced this will be enough. At least as it currently stands. The core loop of explore, gather, craft, and build is complicated by a game that is honestly just too sparse and lacking in density to provide a consistent experience. Gathering resources is an arcane and incredibly tiresome process. Common ores are never far away but there’s little you can build without the rarer materials. I wandered a massive distance in order to find an uncommon resource for my crafting table and ended up with nothing. Lacking No Man’s Sky’s lush colors and various complications, this process felt interminable. The game tries to help by providing a drone companion that can patrol with you and even gather resources but they only manage to reduce the frustration by a small degree. Robo-buddy or no, it felt like one hell of a grind. Osiris compensates with a more kinetic experience. You run faster, jump higher, and shoot a lot of alien bugs. The first time I battled a spider monster with nothing more than my pea shooter space pistol was a damn good time and I’m not going to forget my confusion and panic from the time I walked into a thicket of spiked land coral, unable to distinguish them from grass. My suit punctured, oxygen bursting out. Quickly, I blasted my suit’s thrusters and patched the leaks with tape. These were intense moments but they were only moments. By and large, Osiris feels defined by a series of tiresome labor and never anything too wondrous or inspiring. A variety of crafting options allow you to expand and customize your home base. You can build barracks and laboratories. Enough resources can give you transportation options from rovers to a space ship. But there’s not really too much to see or even much to do once you’ve settled your own piece of the frontier. Thankfully, you don’t have to play alone. The game also boasts a modest but enjoyable multiplay mode. Being stranded in space alongside a handful of other players definitely makes for a better time. Roving around in vehicles or rushing off to fight alien creatures is made infinitely more exciting with a few friends at your side. Strict limits regarding the number of players and structures on a server can sometimes bring the fun to a screeching halt though. This is not to suggest that Osiris will not grow into a robust and strong space game. This is Early Access after all. Expanding the outer bounds of exploration while making some changes to the raw amount of labor present in the early game could turn this into something really spectacular. My time with Osiris as it currently exists was largely frustrating. The pieces are in place for a great game but it will definitely be an uphill battle.